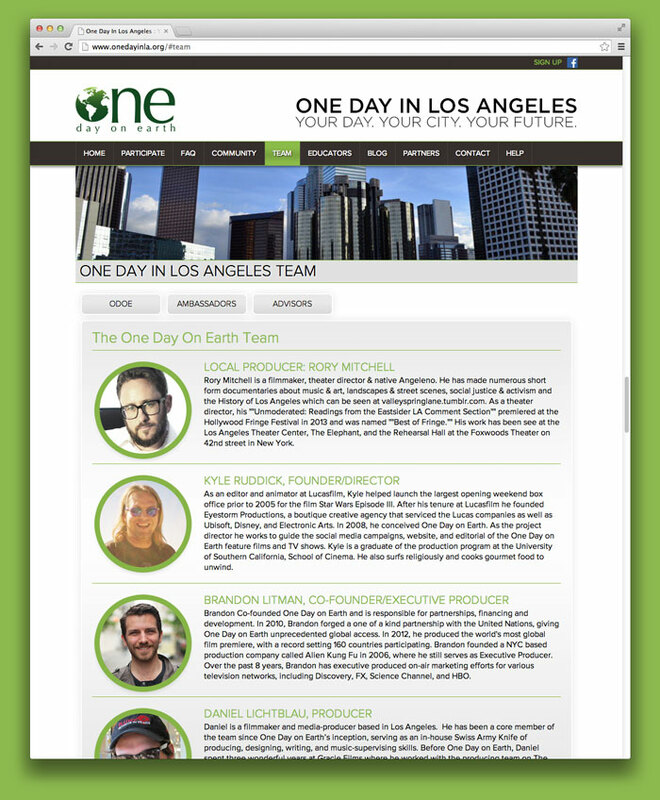 One Day On Earth started as a global collaborative film project and online community. Since the success of the initial project, they have continued to work with creatives all around the globe and produce media that impacts how we view the world we live in. Jekyll Works had the pleasure of working with One Day On Earth on designing & developing their web presence as well as the video uploader and archive map that every participant has used for the collaborative film projects. One Day on Earth started off building a custom social networking site on the Ning open social platform. Project participants could share their photos and videos as well as communicate with each other. Jekyll Works was tasked to design a site that represented the ODOE brand. It had to look totally custom and stay within the confines of the Ning template system. After design approval, we started developing on Ning 2.0 and had to bend the templating system to accommodate the design. Currently the One Day on Earth community is over 18,000 members strong and it’s our job to make sure the site design stays relevant to current trends and that it functions on standards based browsers and devices everywhere. After three successful years of social media collaboration and the creation of the One Day on Earth feature film, it was time to focus the project on 11 individual U.S cities, with YourDayYourCity.org. Jekyll Works designed and worked with other developers to code websites for the participating cities. Each site featured city specific content passed through a custom template structure. These single page scrolling sites helped inform new and existing One Day on Earth members of video submission deadlines and important information. 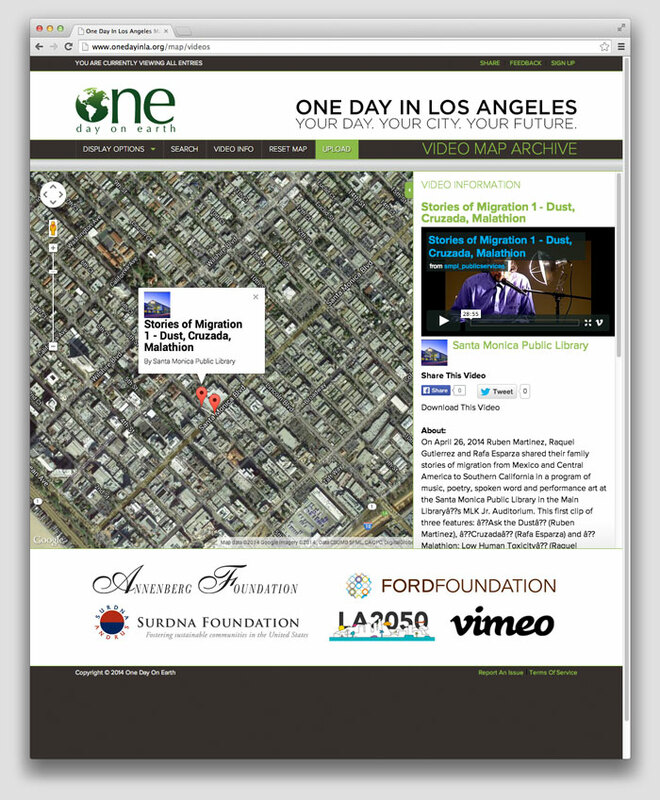 The One Day on Earth video archive map used the Google Maps API with custom location markers that displayed where a particular submitted video was shot. Along with the location and meta data related to the video, the participating member info is also displayed. Jekyll Works designed the interface to merge all these data streams together in an easily understandable way. Jekyll Works did the front end development and design for the video uploader. The uploader worked in conjunction with participating sponsor Vimeo’s API. It connected a One Day on Earth member with their Vimeo account for submitting footage captured on an event day. The uploader was designed to collect important meta data related to each upload that included geo location, footage format, time of day captured, and tags for searching.